A few months ago, I was searching for a necklace to replace my worn out horseshoe necklace and my "fearless" bracelet. I'd happened upon the bracelet years ago in a little shop in Annapolis. It's basically irreplaceable and starting to fall apart. The horseshoe necklace was a gift from a friend reminding me to make my own luck. Finding something to replace those trinkets that carried personal meaning was a tall order. Finally, I settled on a tiny sailboat that came with a card reading "Make Waves." I wear it almost every day as a reminder to make waves throughout my daily life. It's a tiny, silver reminder to always go big, to do my best and to not fear making waves of goodness that ripple out beyond me. Most days, that's in my job. In writing stories that might disrupt the status quo but still playing it straight and not falling victim to the overuse of subjective adjectives, or asking complicated questions about difficult topics. Sometimes it's in setting the bar higher and higher and pushing myself to reach those seemingly unattainable goals, and bringing others up to that level with me. It would be easy to sit back and let things happen. To say that it's not my job, or just not engage. True, making waves sometimes exhausts and frustrates me, but I'd rather live that way than to have made no meaningful impact with my life. There are plenty of days when I fail to live up to my own high bar, when I'm tired and stressed and good enough is just good enough. Some days, I can only muster the energy to focus on one issue and have to tune all the others out to ensure the most pressing task is accomplished. But every morning when I put that little sailboat around my neck, it's another shot at making waves. In so many of my new projects, in journalism, with the skating rink, veterans groups in town, I know I've disrupted the balance as it was. With fresh, not from here eyes, and my experiences, I brought new ideas and energy to projects that were doing just fine, but could be better. I'll admit to starting slow here in Great Falls for fear of rocking the boat too much before taking the time to get to know the existing way of doing everything. Not everything is broken. I didn't want to be seen as some East Coast elitist coming in and bossing everyone around. Not everything needs to be fixed, but that doesn't mean you can't bring a wave of enthusiasm and energy to the party. I once read that we all owe it to the world to do what we can with the skills we have. I took that to heart and genuinely believe that I owe it to my readers, to skaters, to journalists, to veterans, to do the best I can with my skill set. Certainly, I'm not the greatest writer to ever put pen to paper and I'm no Tara Lipinski, but when faced with an opportunity to make some waves, you can bet I'm going to give it a go. It might be my fundamental character that simply won't let me walk away from a chance to help, even if it might frustrate or exhaust me. I just can't stop myself. Making waves, to me, isn't turning the world on it's side and seeing where the chips fall. It's not reckless abandon or disregard for rules and structure. It's working within those confines to do something great. It's using what you have, thinking outside the box, getting other people with useful skills to buy into your hair-brained idea and making something incredible happen, together. So get out there and rock the boat a bit. I'll be looking for your waves. 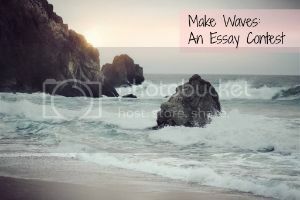 Join me, Alicia of Jaybird, Erika of All Things E and Rachel of Tossing the Script for a Make Waves essay contest. Each of the hosts will share their story this week and on Friday, we open the contest to you, dear readers, to share your stories. When the contest ends, the four of us will read all the essays and choose a winner, who will receive the same sailboat necklace from Dogeared Jewelry that inspired me and free ad space from the hosts. Don't forget to use #MakeWaves when sharing your posts on social media. Grab the button below to share the contest with your readers if you'd like! I'm so in love with this! you are amazing, and I can't wait to participate. Thanks so much Jamie! We can't wait to have you! Hurrah! I'm so glad you got this started. I like the reminder that you can make waves without going wild--trying your best, pushing people to consider new ideas, working for the betterment of your community are all great ways to make waves. I'm so glad you, Erika and Rachel made this so much more awesome! Exactly, there's no need to be a tidal wave and wreck everyone's world, but steady waves can definitely make a difference. I wonder how many times I could have made a wave but was too afraid to rock the boat. That necklace is really pretty and a great reminder to do just that! Thanks for sharing and for hosting! I'll be thinking about what I want to write about. Thanks Amanda! We look forward to reading your post! I love this! "Making waves of goodness" is such a happy phrase. I love how you interpreted "we all owe it to the world to do what we can with the skills that we have" too. Now I'm thinking...my essay will be coming soon. Thanks for making me think! What a brilliant and beautiful reminder to make waves. I think you're totally right, making waves isn't about giving the world a good shake up and walking away, it's about the little things we stick by that make changes that are important to people.